My kids are always looking for snacks. Always. I try to make those snacks as healthy as I can. Sometimes, though, it’s fun to give them a treat that they will love. My kids love s’mores. So I made them some S’mores Snack Mix. This is more of a dessert snack mix. I added peanuts this time. It makes the snack mix taste more like a Reese S’more. Never had a Reese S’more? You put a peanut butter cup on the s’more instead of a chocolate bar. They are so good! The peanuts are totally optional, though. I added them for a little nutrition. Some protein to offset the sugar. Combine all the ingredients, mix gently, and enjoy! I layered all the ingredients in this container, then gently turned the container to mix. The marshmallows will dry out after a couple of days. So if you want to make the mix ahead of time, leave the marshmallows out. 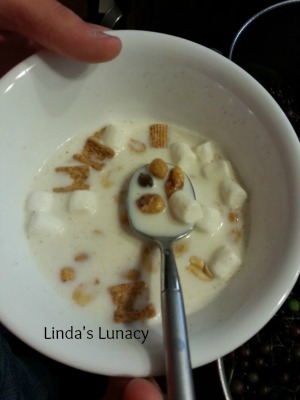 When you are ready to eat it, pour the snack mix into a bowl and add the marshmallows. 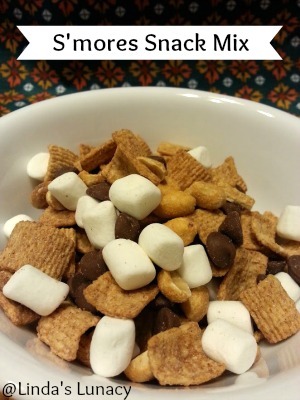 My kids love this S’mores Snack Mix! I have to admit, it’s pretty good! 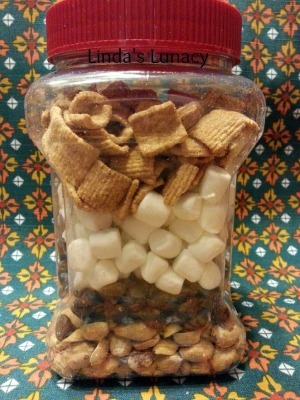 Pin this S’mores Snack Mix Recipe for later! Looks yummy.Thank you for sharing for with us at #HomeMattersParty. We would like to see you again next week.